One of the worst mistakes a DIYer can make is to buy cheap tools. Buying cheap tools meant for high torque applications is a recipe for disaster. That’s not to say you can’t buy good impact sockets at a reasonable price, but you should always shop around cautiously to avoid something that will snap into pieces at the first sign of resistance. The following sets are not only affordable, they are some of the best impact sockets out on the market. All of these are known to be highly durable and designed to withstand high amounts of torque from your impact wrench with minimal risk of damage to bolts and nuts. 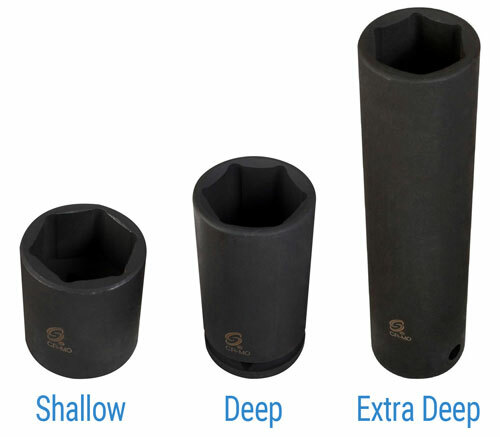 Shallow vs Deep vs Extra Deep Well – Which Should I Get? Why Are Impact Sockets Black? Which Drive Size Should I Get? When you want best 1/2 inch drive impact sockets in one master set, this will likely be the first (and last) stop you’ll ever need to make. Each piece of this impressive 43-piece set is made of high-quality CR-MO alloy steel that will withstand even the torquiest air impact wrenches. The hex and square drive inserts have radius corners to reduce wear and tear. Four extensions include a unique universal joint which allows you to angle the socket up to 22 degrees. 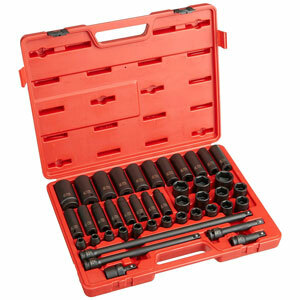 This metric set includes both shallow and deep sockets ranging from 9mm to 30mm. The shallow sockets are ideal for working in cramped spaces, while the deep sockets are perfect for lug nut removal. Best of all, every component meet or exceed ASME specifications and come in a sturdy carrying case. A 39-piece SAE version of this set is also available. Easy to read laser etched measurements are standard. One of the most unusual compliments this set receives is regarding the case. A great set needs a quality case, and the one included is both a socket organizer and secure enough to protect against accidental spillages. The case even has stamped measurements and the durability makes it hard to beat for the price. We still prefer storing sockets in a standalone socket organizer but this case is actually usable. It should be noted that the wells in the deep sockets narrow partway down, limiting the functionality in some scenarios. 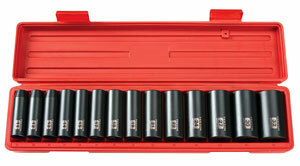 This offering from Tekton isn’t just another cheap impact socket set. Instead, the 14-piece set is made of forged and heat-treated chrome vanadium steel that has a corrosion-resistant black phosphate finish and high contrast laser-etched markings. The extra deep broach allows longer fasteners to be used, while the high-torque 6-point socket design aids in preventing rounded edges. The metric set (SAE version here) includes sizes ranging from 11 to 32 mm and comes with a carrying case for easy storage. All pieces of this deep impact socket set meet or exceed ANSI performance standards. For those who need to work in tighter spaces, a shallow version of this set is also available. Don’t let the CR-V metal fool you, this set can hold up to a lot of abuse. The hex design does a good job of gripping even the toughest bolts, while the case does a good job of holding everything securely and is sturdier than the ones for many similar sets. Tekton has always had a reputation of making good quality tools at a low price and they don’t disappoint here. A complaint mentioned a handful of times with this set is the habit of getting two of a socket by accident. This problem is often compounded by some sockets having the wrong size etched on them. Tekton does its best to remedy these errors, but it would be better if they were caught prior to shipping. 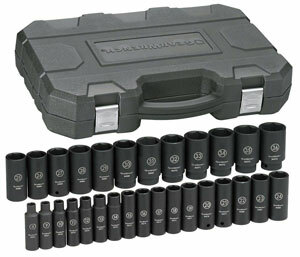 Made of CR-MO alloy steel and coated in black phosphate, this 29-piece set contains some of the best impact sockets for the money. The hex openings use a radial off-corner loading design to minimize corner rounding on tough jobs. Markings use both laser etching and hard stamping (on opposite sides) to create lasting, high-visibility text. The entire set comes in an attractive, durable blow mold case to further extend their lifespan in even industrial settings. There’s no denying the power these sockets provide with both air and cordless impact wrenches, and some customers swear they can actually feel the quality when holding one. The case uses pins at the hinge joints, allowing you to disassemble it easily. Another perk of this set is that no sizes are skipped, meaning there’s no need to order additional sockets to complete your set. There have been a few quality control issues reported, often involving duplicate sockets being included. This is especially troublesome as GearWrench’s usually excellent customer service has been known to hassle customers over certain issues with this set before remedying it. This is not true of all issues, thankfully, but when you have a problem with bad coating or scratches, the process can become frustrating. This 10-piece set may be on the smaller end of our list, but the ability to be used with both wrenches and impact drivers makes it an excellent addition to your toolset. The eight sockets and two adapters have a smaller footprint and come with a case which uses pivoting organization pins to give it more on-site functionality. Each piece uses laser etching for improved readability, as well as having recessed corners to reduce rounding and increase the socket’s lifespan. These sockets hold up really well for their size, and the carrying case is very good at keeping the sockets in place when jostled about. Owners report that the sockets fit well on both drivers and wrenches, and that they’ve got good weight for their smaller profile. While the thinner wall design of these sockets gives them a smaller footprint, it also reduces their durability. As such, it might be best to reserve the most difficult tasks for a standard width socket. The carrying case is also a lot bulkier than it needs to be, as it’s designed to hold one of your wrenches in addition to the included parts. This 11-piece set is made of heat-treated CR-V alloy steel with an industrial black powder coat finish. 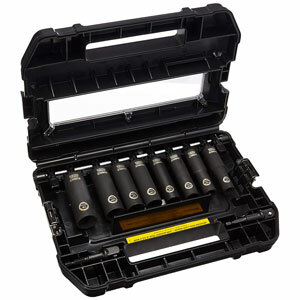 Socket sizes range from 10 to 24 mm and come in a sturdy carrying case. The hex design is rounded to reduce corner contact and prevent fastener wear while improving the grip on frozen or rusted fasteners. A balance between slim profile and durability means the perfect blend between accessibility and strength. To top these features off, all sockets meet or exceed ANSI performance specifications. This set is excellent quality for such a minimal price, with owners reporting excellent durability when compared to more expensive brands. Many of these owners have had this set for a decade or more without needing to replace a single socket. This makes it a great set to buy when you need to replace missing or damaged high-cost sockets. The biggest problem with this set is the choice of sizes that were included. Many commonly used sizes (for example, 15 mm) are omitted. The problem is emphasized by the lack of extra spaces in the case, requiring you to get a new case if you purchase the missing sockets or simply using a separate socket organizer in your tool chest. Impact sockets are heavy-duty essentials for automotive work, although they can also be used for non-automotive functions. Owning a good set of impact sockets means being able to get rid of several large tools in favor of compact, space-saving heads that can be interchanged as needed. But there are other benefits to owning a good impact socket set over standard sockets. Knowing these benefits will help you understand how even a cheap impact socket set is a good long-term investment. Impact sockets have a lot of benefits over regular sockets, beginning with the steel alloys used. A regular socket works well enough on day to day projects, but is often too fragile to handle high torque situations. Impact sockets also tend to include textures that improve grip and reduce the risk of rounding, whereas standard sockets use a simple hex design known to round corners over time. When working at a home garage, you can often get away with standard sockets for the odd job, but you’ll want a good impact socket set if you plan on doing regular automotive work. This largely depends upon the task, so it’s best to own either a combination set or a full set of shallow and deep. However, you can get away with owning one if you plan ahead for which tasks you might be performing most often. Deep sockets are ideal for lugs or nuts that sit an inch or more below the top of the bolt or stud you need to release. Shallow sockets fit into more cramped spaces and are ideal for situations where the nut or bolt head isn’t sunken around a stud. Extra deep sockets are invaluable for some jobs but usually not necessary for daily use. There are two major reasons you’ll always see impact sockets in a black coating and standard sockets in a chrome coating. The first is a simple matter of identification. When you’re reaching for a loose socket, you don’t want to spend extra time discerning the type of socket before using it. The second deals more with durability than function. Chrome plating adds some degree of protection from rust, but the black is often made of a black phosphate coating that has improved resistance to liquids and other causes of damage to the underlying metal. This doesn’t mean the sockets are any stronger overall (the type of steel alloy determines that), but you’re less likely to suffer damage if an impact socket is dropped into a puddle of water or grease. Sockets come in three main drive sizes: ¼ inch, ⅜ inch, and ½ inch. Of these, the ⅜ inch is the most commonly used and likely your main socket set, but ¼ inch sockets are useful for reaching small nuts and bolts or fitting into tight spaces. ½ inch sockets, meanwhile, stand up better to high torque use such as with impact wrenches and are usually the best option when a long ratchet or breaker bar is necessary. The black phosphate (or similar coating) on impact sockets is also used because the metal of the sockets actually flexes during hi-impact use. Traditional chrome plating will eventually crack and flake off of the socket over time due to the flexing during impact use, as it is much stiffer than the steel of the socket. It would be worth noting that impact sockets should ideally be made from chrome-molybdenum as opposed to CRV. The crv used in regular sockets and also in some cheaper impact sockets is more rigid and also more brittle, which can lead to crv sockets cracking or even shattering when subjected to impact.